The Philadelphia rod consists of two sliding sections, which can be fully extended to a total length of 13.10 feet. When the sections are entire] y closed, the total length is 7.10 feet. For direct readings (that is, for readings on the face of the rod) of up to 7.10 and 13.10 feet, the rod is used extended and read on the back by the rodman. If you are in the field and don't have a Philadelphia rod, you can use a 1-by-4 with a mark or a 6-foot wooden ruler attached to a 2-by-4. In direct readings, the person at the instrument reads the graduation on the rod intercepted by the cross hair through the telescope. 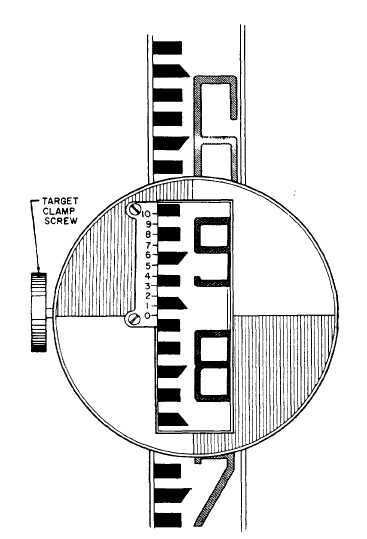 In target readings, the rodman reads the graduation on the face of the rod intercepted by a target. In figure 5-8, the target does not appear; however, it is shown in figure 5-9. As you can see, it is a sliding, circular device that can be moved up or down the rod and clamped in position. It is placed by the rodman on signals given by the instrumentman. Figure 5-9. - Philadelphia rod set for target reading of less than 7,000 feet. The rod shown in the figures is graduated in feet and hundredths of a foot. Each even foot is marked with a large red numeral, and, between each pair of adjacent red numerals, the intermediate tenths of a foot are marked with smaller black numerals. Each intermediate hundredth of a foot between each pair of adjacent tenths is indicated by the top or bottom of one of the short, black dash graduations. As the levelman, you can make direct readings on a self-reading rod held plumb on the point by the rodman. If you are working to tenths of a foot, it is relatively simple to read the footmark below the cross hair and the tenth mark that is closest to the cross hair. If greater precision is required, and you must work to hundredths, the reading is more complicated (see figure 5-10). For example, suppose you are making a direct reading that should come out to 5.67 feet. If you are using a Philadelphia rod, the interval between the top and the bottom of each black graduation and the interval between the black graduations (figure 5-11 ) each represent 0.01 foot. For a reading of 5.76 feet, there are three black graduations between the 5.70-foot mark and the 5.76-foot mark. Since there are three graduations, a beginner may have a tendency to misread 5.76 feet as 5.73 feet. As you can see, neither the 5-foot mark nor the 6-foot mark is shown in figure 5-11. Sighting through the telescope, you might not be able to see the foot marks to which you must refer for the reading. When you cannot see the next lower foot mark through the telescope, it is a good idea to order the rodman to raise the red. On the Philadelphia rod, whole feet numerals are in red. Upon hearing this order, the rodman slowly raises the rod until the next lower red figure comes into view.